Will serve the firm in area of Government and Environmental Affairs. Gary E. Slagel has joined Steptoe & Johnson PLLC’s office in Canonsburg, PA. as Government Affairs Specialist to the firm. 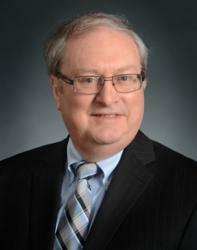 Slagel comes to Steptoe & Johnson after a 35 year career with CONSOL Energy, Inc. and CNX Gas. During his career at CONSOL, he served as Senior Advisor of Environmental Affairs, Director of Environmental Regulatory Affairs and as the Director of Government Affairs. His career focused on the coal and natural gas industry and the complex issues surrounding shale gas exploration and development. Steptoe & Johnson is nationally recognized as an energy firm with core strengths in Energy Law, Labor & Employment Law, Litigation and Transactional Law. In 2013, Steptoe & Johnson celebrates 100 years of serving the needs of energy clients across the country and around the world. Visit http://www.steptoe-johnson.com. For more information, contact Betsy Spellman, Chief Marketing Officer, at (304) 933-8000 or by email: betsy.spellman (at) steptoe-johnson (dot) com.